We sent Karis Bouher, a blogger and food lover to sample the best food to try in Andalucia. Here’s how she got on. Andalucia is a diverse region in southern Spain that receives on average 300 days of sun every year. 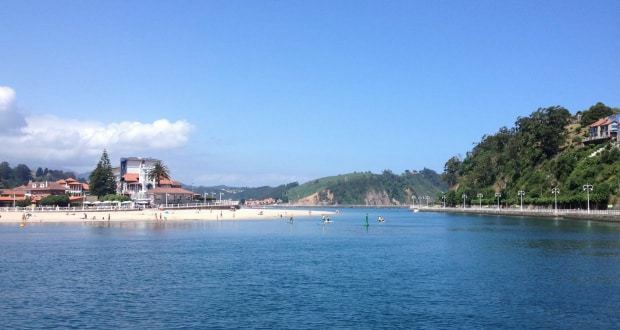 You’ll find perfect beaches and picturesque mountains, alongside rich history from its Moorish past. 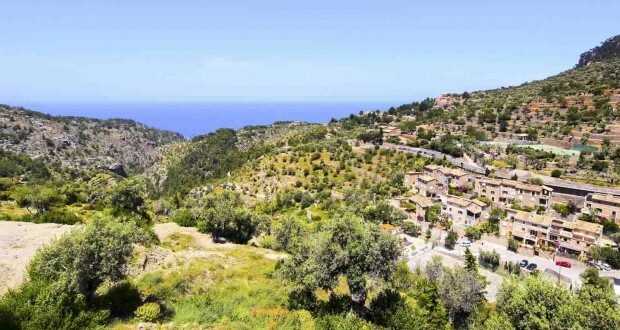 As a result, the whole of the Andalucia region is a stunning tourist destination where thousands flock every year for time away from the hustle of their everyday lives. One thing that people may not realise about this region is that it produces amazing food – world-class seafood on the coast, beasts in the shade of the trees, and fresh, organic fruit and vegetables galore. So I’m keen to share with you the best food to try in Andalucia this year! I was lucky to tour half of the region recently as part of the Tasty Andalucia campaign, which aims to showcase the produce that comes from its eight provinces. We visited Huelva, Seville, Cordoba and Cadiz over four very busy days to try and take in all they could offer. Contrary to popular belief, plankton isn’t just for whales! Plancton Marino grow their plankton at Veta La Palma, a fish farm within Doñana National Park. 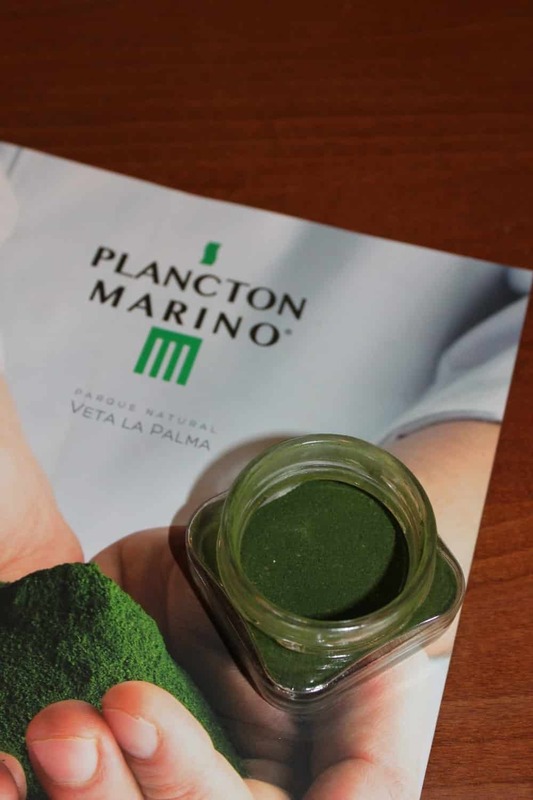 You wouldn’t think to pop this vibrant green product of the sea into your cooking, but it’s gaining in popularity and chefs all over Spain love working with it and for good reason – it tastes like the sea and brings a refreshing flavour to their dishes. I recommend trying plankton at Sanbers Restaurant in Seville in the form of plankton ceviche or a local specialty, Tortilla de Camarones – a Camarone shrimp fritter a bit like a giant chip. 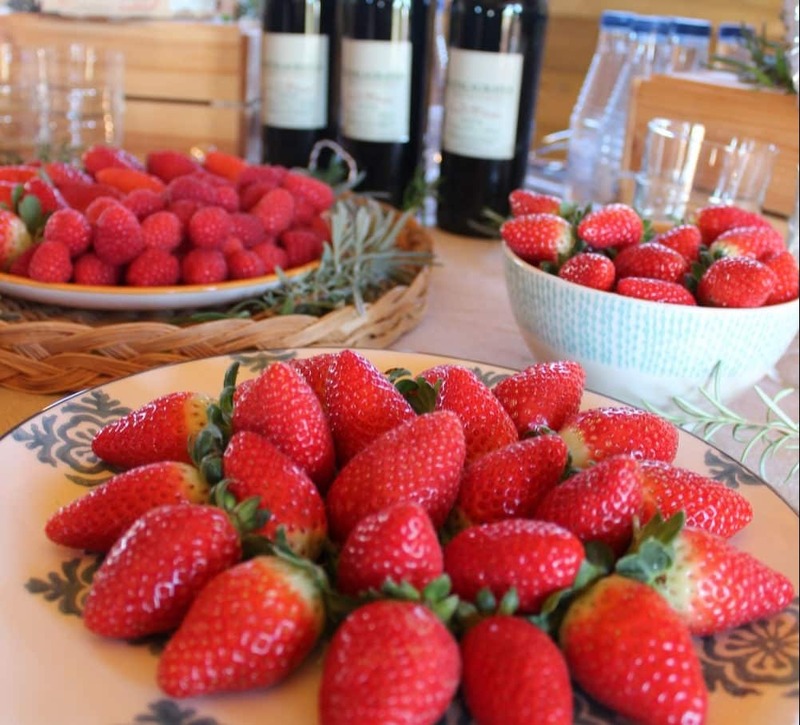 Also within the Doñana National Park, you’ll find a berry farm dedicated to producing organic strawberries, raspberries, blackberries and blueberries using sustainable practices (plus, they have a donkey sanctuary!). The passion at Flor de Doñana for what they grow is contagious and after meeting the team there, I was just as excited as they are about their products and their farming techniques. 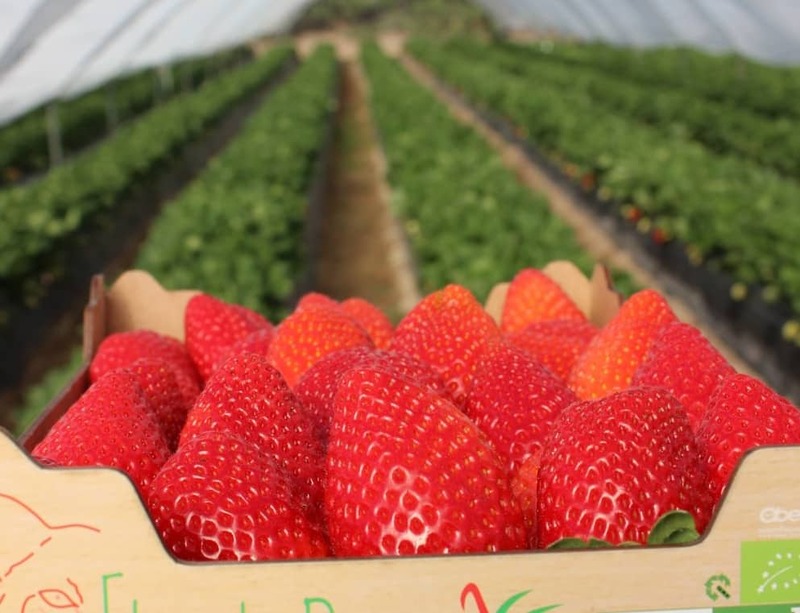 I was lucky enough to eat their fresh strawberries and raspberries, and pick a punnet myself, which I got home a week later and ate with just a little clotted cream for dessert – divine! 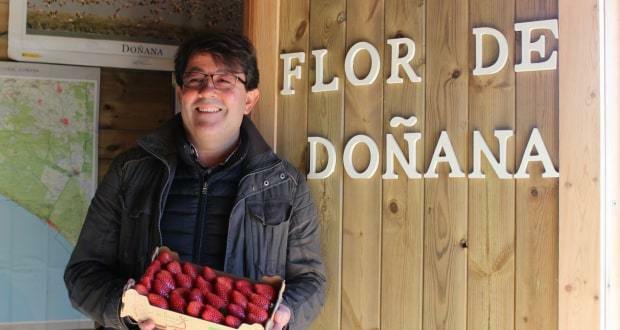 Flor de Doñana send their produce to Switzerland, Germany and the UK, where you’ll find them at Waitrose and Sainsbury’s – if you’re lucky! While you’re in the area, do check out the Doñana National Park. It’s a UNESCO World Heritage site home to all manner of wildlife, including that much-loved pink bird – the flamingo (well, 40,000 of them!). Bird watchers and non-bird watchers alike will love exploring. Find out more here. 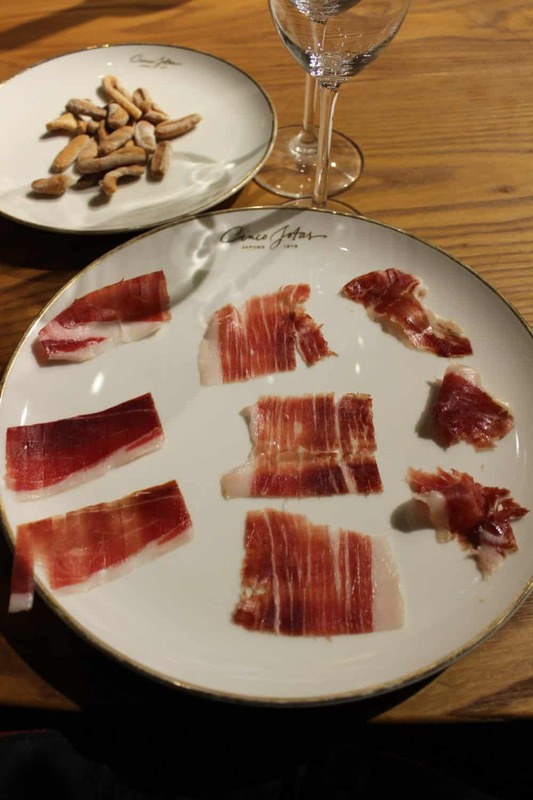 Considered one of the best –and the most expensive– hams in the world, Cinco Jotas (or 5J) is one of the oldest jamon brands in Spain and certainly one of the most respected. It’s a family-run business who pride themselves on not just the high quality of their acorn-fed ham, but the process of making it. The whole process was an eye-opener for me: the 100% Iberico pigs (pata negra) are farmed around the Iberian peninsula to ensure they live their best lives before being slaughtered. 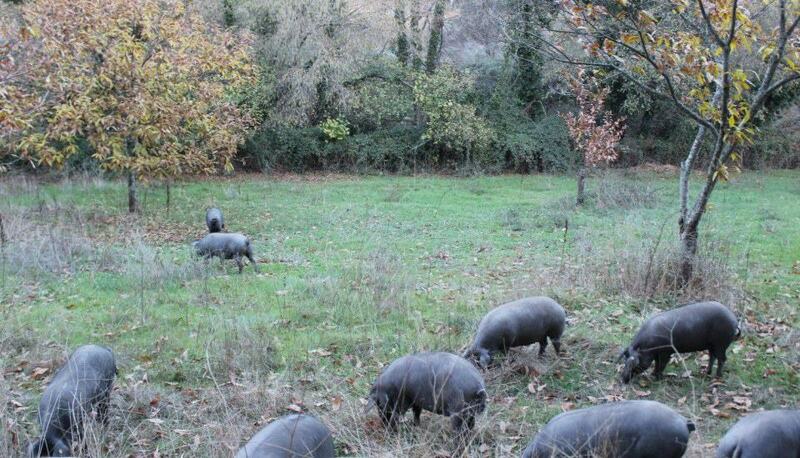 Each pig has 2 hectares of lush green land, with plenty of oak trees to satisfy their hunger for acorns. When they say ‘happy as a pig in mud’, what they should say is ‘happy as an Iberico pig eating acorns’ – I’ve seen it! 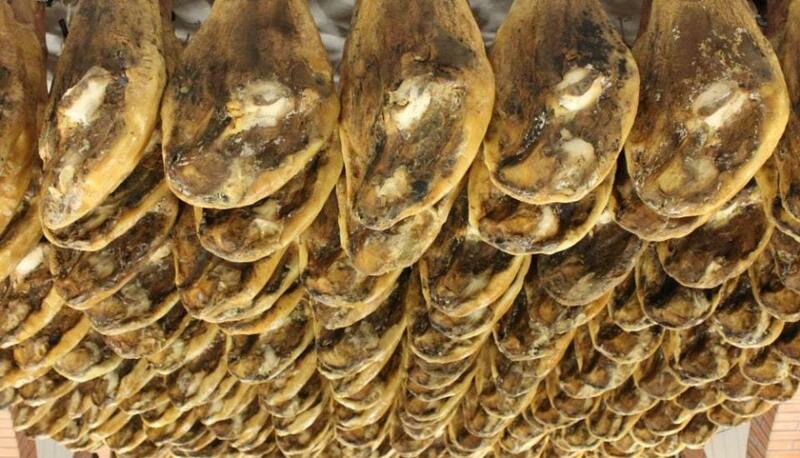 All those acorns give the meat and fat flavour, which is of course why Cinco Jotas jamon is so good. Once they are ready, the pigs are slaughtered (humanely) and then butchered, ready for the curing process to begin in Jabugo, Huelva. Simply put, there is a little more than salt and a lot of passion that goes into the curing process, but it really is more complicated than that and I don’t want to spoil a trip to the Cinco Jotas curing cellars in Jabugo to see how the ham is made (and you’ll get to try some) (€15). You can buy Cinco Jotas ham online here. Olive oil is a massive part of Spanish culture and tradition. But, did you know that Spain is the world’s biggest producer of olive oil and much of the production happens in Andalucia? I visited Hacienda Guzman for a tour and olive oil tasting. Olive oil tasting, I hear you ask? Yes, it’s totally a thing! It was actually my second time tasting olive oil the proper way and let me tell you, it’s very different to wine tasting. If you’ve never done it, it’s absolutely worth it for what you’ll learn. If you enjoy seeing where your food comes from, take a trip to Hacienda Guzman. 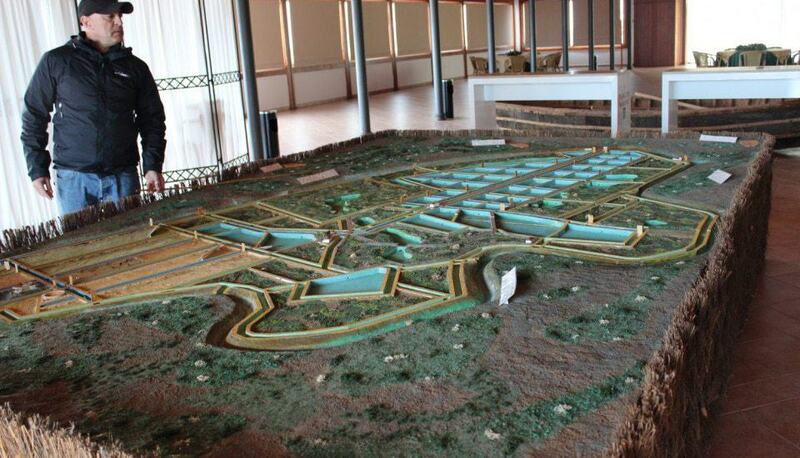 Their olive museum will give you the opportunity to see more than 150 varieties of olive tree from 13 countries. Plus, their 18th Century oil mill and courtyard will give you an insight into how olive oil was made hundreds of years ago (and how it has improved significantly, of course). In fact, Hacienda Guzman was owned and run by Christopher Colombus’ son, Hernando Colón, who exported the olive oil he produced there to the Americas. 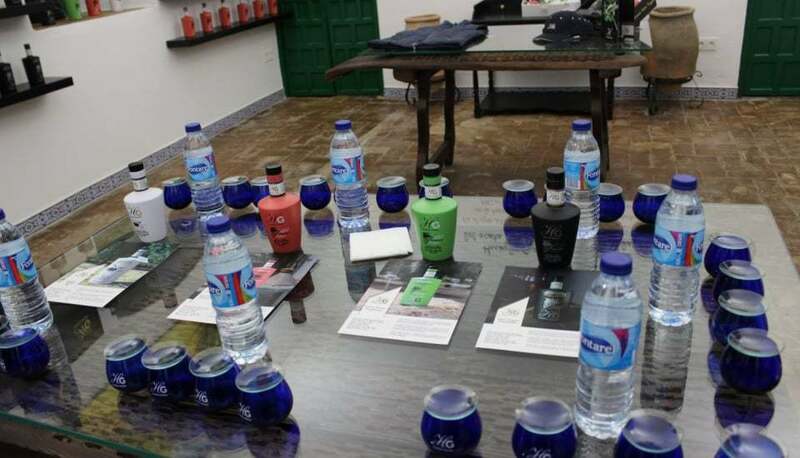 My favourite was the Reserva Familiar Arbequina (pink bottle), you can buy it online. 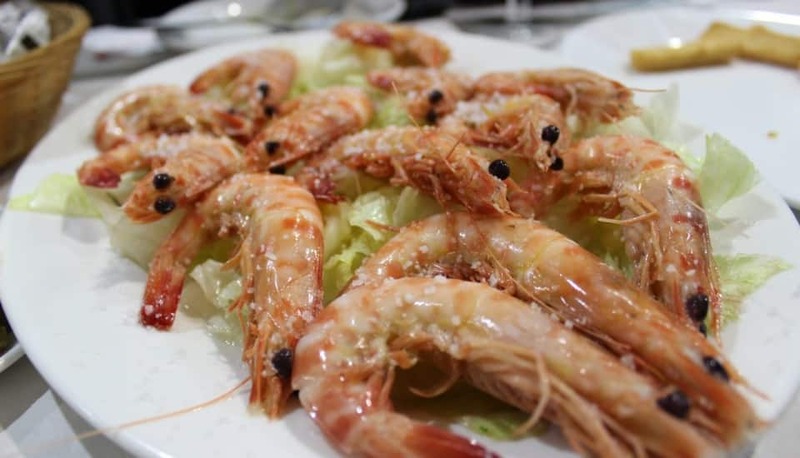 Sanlucar is known for its King Prawns, in fact they are the only prawn in Spain with a designation of origin. And, they’re really good! These prawns don’t need much in the way of preparation – just boil them, and sprinkle with salt; you honestly don’t even need sauces, they’re that good! Eat them in Sanlúcar de Barrameda, just an hour and a half from Seville on the coast. 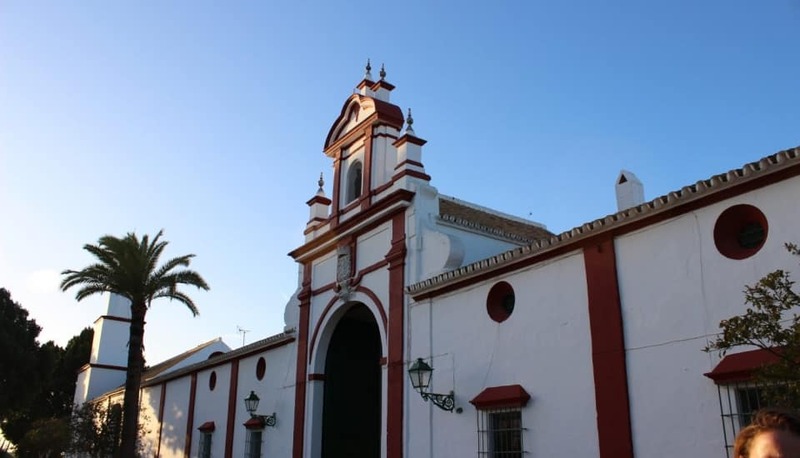 If you’re a passionate prawn lover, you may want to attend the Feria de Langostino, or Festival of Sanlúcar Prawns, held once a year by the Cofradía de Pescadores de Sanlúcar. 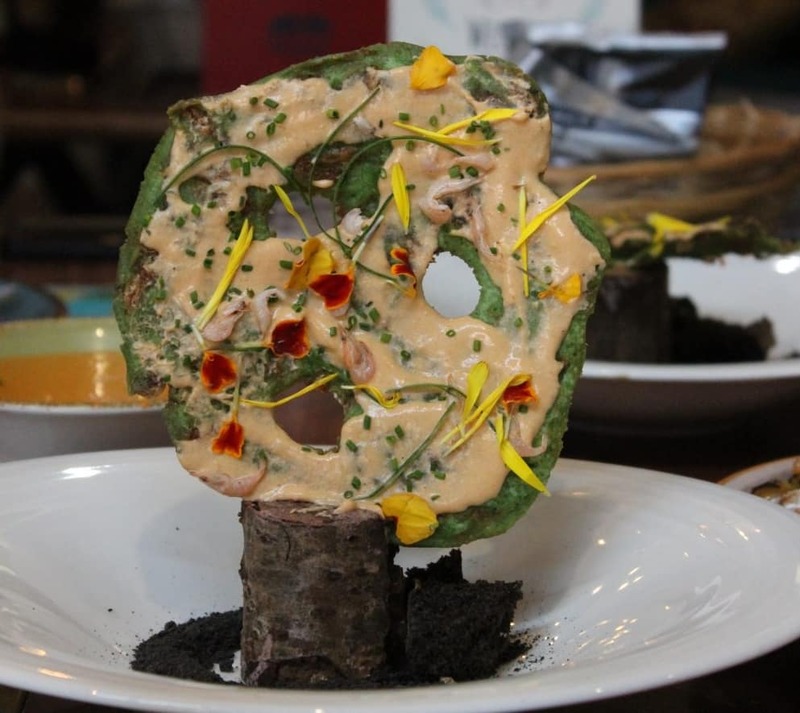 I was lucky to visit Spain recently as a guest of the Tasty Andalucia campaign. I would like to thank the companies who looked after us during the trip: Plancton Marino at Veta La Palma, Hacienda Guzman, Flor de Doñana, Cinco Jotas, Bodegas Robles, Gonzalez Byass, The Osbourne Group and The Fishermen’s Association of Sanlucar.